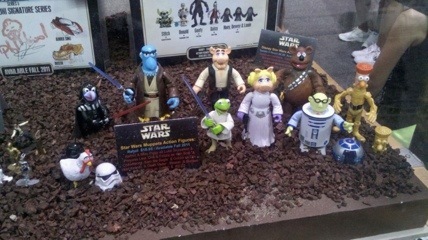 I might have to wait until the Fall to purchase the upcoming Muppet Star Wars figures, but that doesn’t mean I can’t pine for them now. After posting a link to the figures on Facebook last week my old friends Erik & Kelly Hess sent me a text of the figures on display at the Magic Kingdom (or maybe Disney/MGM Studios). They’re down in Orlando for Star Wars weekend. Thanks for the in-person evidence! Can’t wait for these toys!